Volunteers are important partners in The Seattle Public Library’s mission to provide everyone in our community with knowledge and information that supports lifelong learning. 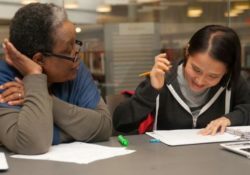 The Library welcomes individuals who are at least 18 years old to explore the many volunteer opportunities at the Central Library and branches throughout Seattle. For more information, please visit the Seattle Public Library website, or call the Volunteer Services Infoline at 206.386.4664. The Foundation also has group volunteer opportunities at fundraisers and other events for your company or organization. Please contact the Foundation at 386.4130 or foundation@supportspl.org.